Here at Pro-Lock & Safe, we have over 30 years of experience providing locksmith services to Georgetown and around Delaware. That’s 30 years of key cutting and popping locks, but we also do so much more than that! We are, by training, the lock and key experts. This means we’re perfectly positioned to provide all sorts of security help for homes and businesses alike. We can handle simple lock tasks like rekeying and lock repairs, but we can also do more complex security updates like installing an access control system with CCTV. No matter what your locksmith needs are, we can help. Call Pro-Lock & Safe in Georgetown today! When you need a locksmith in Georgetown, you can turn to the team of experts at Pro-Lock and Safe. We’re just down the road and there’s nothing we’d love more than to make sure your needs are met. Whether you’re locked out of your home, your business, or your car, we can help. For over three decades we’ve been gaining experience in our industry and making it a point to learn as much as possible about our trade. That means that when you locked your keys in the car, we can help. 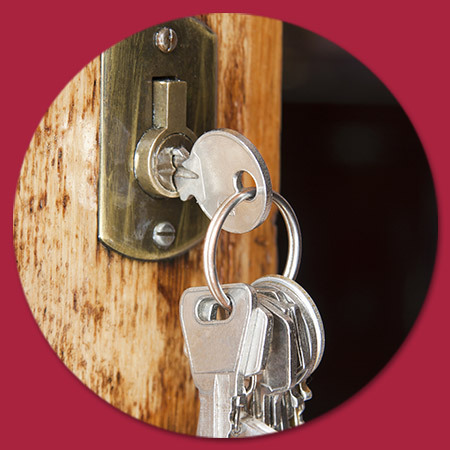 When you need to get the locks to your home rekeyed, we can do that. When you need to get a car key cut, we’ll take care of you. With 24-hour availability, we can help you out whether you’re in the middle of an emergency or you’d like to schedule a visit for some time in the future. As a matter of fact, when you contact our team, we’ll provide you with a timeframe for our arrival as well as a free quote for the work that needs to be done so you don’t have any surprises. It’s as simple as that! If you’re looking for a locksmith who is licensed, bonded, and insured, look no further. At Pro-Lock and Safe, we take our jobs seriously in order to best meet the needs of our customers. No matter what situation you find yourself in, you can rely on the team at Pro-Lock and Safe to provide you with high quality customer service and unmatched attention to detail. Regardless of the job you have for us, we’re here to help. If you’re looking for a locksmith in Georgetown, your search is over. Don’t hesitate to give us a call today!